This black and white photograph shows a couple standing beside a J.R. Watkins Medical wagon with sampling cases near Eureka, Kansas. The medical company, founded in 1868 by Joseph Ray Watkins from Plainview, Minnesota, sold medical liniments and salves from the back of a horse drawn wagon. 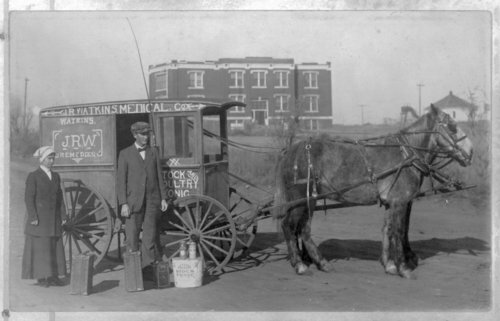 The company may have sold supplies for animals as well as humans because a bucket in the front of the photograph is labeled "stock tonic" and the wagon has "stock and poultry tonic" on it.